Cathy Lee CRANE has been making experimental narrative and documentary films on 16mm for nearly twenty years. She was named a Guggenheim Fellow in 2013 and received the New York Foundation for the Arts Fellowship in Film in 2009 for her lyrical re-combinations of archival and staged material. The completion of her first feature Pasolini’s Last Words (2012) was supported by a grant from the New York State Council on the Arts and enjoyed its World premiere at the Festival du Nouveau Cinema in Montreal as a “gem of world cinema” in the Panorama International section. Her short 16mm films (1994-2010) have been broadcast on European television, are held in the Forum des Images collection in Paris, and are distributed by Canyon Cinema and Lightcone. They have won the following festival awards: Best Black-and-White Cinematography (Cork 1996), Best Experimental Film (CSU Media Arts 1997), and the Certificate of Merit/New Visions (San Francisco International 2002). In addition to this short work, she has collaborated as projection designer and cinematographer for Harun Farocki, Joanna Haigood, and Strom/Carlson among others. 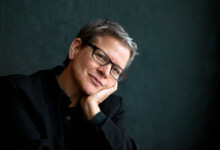 Crane received the first North American survey of her work at LA Filmforum in March 2011 while an Artist-in-Residence in the Directing Program at California Institute of the Arts. She is currently Associate Professor in the Department of Cinema, Photography and Media Arts at Ithaca College specializing in directing actors for film.